We have a well known reputation as the professional plumber and have had great success due to our return customers that keep using and coming back to Diamondback Plumbing. They know they can trust us due to having a solid reputation and a well known name in the plumbing industry serving Scottsdale for over 20 years. The plumbing industry has become more advanced over the last decade. Such advancement and improvement is also noticeable in the equipment used by plumbers. Today, you can see expert plumbers having access to modern and advanced equipment that let them deliver the best service to their clients. What’s good about these modern tools is that these help plumbers deliver an excellent job with the least possible effort. One recent innovations is the video camera damage inspection and detection. Diamond Plumbing takes pride in the fact that we also use state-of-the-art video cameras to deliver an excellent service to our clients in Scottsdale. Video camera detection is a new technique utilized in the plumbing industry, which involves the use of video camera in detecting problems in any part of a plumbing system. The camera used in this process can fit small and large pipes. The tool is even compact in the sense that it can slip through pipes no matter how small it is. Once inserted, it can give our plumbers the essential details regarding the actual condition of your pipes. Video camera detection is not only designed to detect damaged parts in the system. It also works in identifying specific spots in the line that are at risk of breaking. Using this video camera in the plumbing industry is a minimally invasive and efficient solution in thoroughly examining the exact condition of your gas, sewer, and water lines as well as other plumbing systems. The actual distance reached by the video is actually dependent on the scope’s model. The earliest video scope models used by plumbers actually boast of a 10 to 30-meter range. It’s usually sufficient if they are scanning a small or medium sewer line. For larger lines, a scope with a higher range is advisable. Fortunately, more advanced scopes are now introduced in the plumbing industry. It’s even possible to see those that can cover up to a 100-meter distance. It’s a big help when scanning the entire length of all types of lines and plumbing systems. Diamondback Plumbing uses the most recently introduced video scopes available today. Our video scopes have a high range and distance in the sense that it can scan the pipe lines in your office or home. 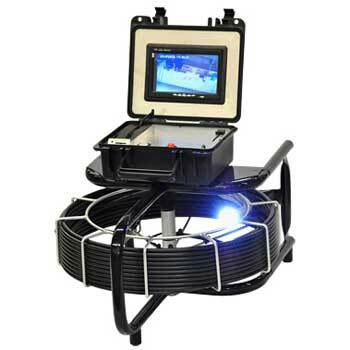 Video camera detection can effectively check the exact condition of your pipe lines and plumbing system. It’s a convenient way to examine the lines for proper maintenance since it does not involve digging the ground to access the buried pipes. It comes with probes that can envision any weak spots in your system. Among the problems often found in pipe lines are blockages and clogs. The problem is that it’s often tricky to spot these issues, especially if they’re deep beneath the ground. The traditional solution for this case is to dig into the ground to locate the damaged pipe. While effective, this traditional solution also has its drawbacks, such as the fact that it’s time-consuming while being costly. It can also put your property at risk of getting damaged. With the aid of the video camera inspection, it’s possible to detect the exact spot where the blockage or clog can be found. This makes the job of plumbers easier as they already know the location and the extent of the problem, so they can figure out the best method to use in clearing blockages and dislodging clogs. If you are interested in hiring affordable plumbers in Scottsdale who use the most advanced equipment and techniques, like video camera detection, then there’s no better choice than Diamondback Plumbing. We have been in the plumbing industry for over 20 years, serving thousands of satisfied clients all throughout Scottsdale. Our team is composed of experts in the field of fixing any plumbing issue in residential and commercial properties. Our excellent track record and reputation shows how effective and skilled we are. We offer various plumbing services to our clients – one of which is identifying blockages and clogs through the modern approach, video camera inspection & detection. Expect us to have the latest technology in terms of video cameras used in the plumbing industry. With such technology in our arsenal, we can assure clients of the quick detection of problematic and weak spots in their plumbing systems. We are also skilled in using the cameras for proper and quick sewer line cleaning. For more information about our plumbing services, especially the video camera detection, do not hesitate to contact or email us. We offer 24-hour service. Our team will also visit your area right after you give us a call.